Director General William Dar extends his congratulations to the authors of the Nature Biotechnology journal paper, led by Rajeev Varshney, with Sarwar Azam, Rachit K Saxena, Hari D Upadhyaya, and KB Saxena. Also seen is CLL Gowda, Research Program Director – Grain Legumes. Once referred to as an “orphan crop” mainly grown by poor farmers, pigeonpea is now set to join the world’s league of major food crops with the completion of its genome sequence. 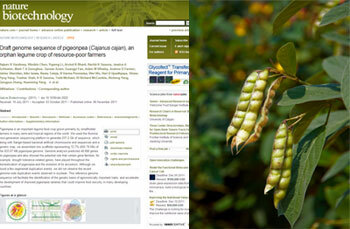 The completed genome sequence of pigeonpea was featured as an advance online publication on 6 November 2011 on the website of the journal Nature Biotechnology, the highest ranked journal in the area of biotechnology. The paper provides an overview of the structure and function of the genes that define what makes a pigeonpea plant. It also reveals valuable clues on how the genomic sequence can be useful to crop improvement for sustainable food production, particularly in the marginal environments of Asia and sub-Saharan Africa. Years of genome analyses by a global research partnership led by ICRISAT have resulted in the identification of 48,680 pigeonpea genes. A couple of hundred of these genes were found unique to the crop in terms of drought tolerance, an important trait that can be transferred to similar legume crops like soybean, cowpea or common bean that belong to the same family. In the fight against poverty and hunger amid the threat of climate change, highly nutritious, drought-tolerant crops are the best bets for smallholder farmers in marginal environments to survive and improve their livelihoods. Pigeonpea, grown on about 5 million hectares in Asia, sub-Saharan Africa and South-Central America, is a very important food legume for millions of the poor in the semi-arid regions of the world. Known as the “poor people’s meat” because of its high protein content, it provides a well-balanced diet when accompanied with cereals. “The mapping of the pigeonpea genome is a breakthrough that could not have come at a better time. Now that the world is faced with hunger and famine, particularly in the Horn of Africa, brought about by the worst drought of the decades, science-based, sustainable agricultural development solutions are vital in extricating vulnerable dryland communities out of poverty and hunger for good,” says Director General William Dar. “Modern crop improvement technologies for smallholder farmer crops such as pigeonpea will be crucial to speed up the development of improved varieties that can provide high yields and improved livelihoods, and at the same time meet the challenges of marginal environments and the threat of climate change and scarce natural resources," adds the Director General. Rajeev Varshney, the lead scientist and coordinator for the pigeonpea genome sequencing project explains how this breakthrough will unlock pigeonpea’s potential. “Having the pigeonpea genome sequence as a reference will significantly speed up and reduce the cost of screening the ‘good genes’ within the stored pigeonpea seed collections in genebanks like that of ICRISAT. This also means dramatically reducing the cost of developing new improved varieties for farmers,” says Varshney. “At the moment, in general, it can take 6-10 years to breed a new variety. With the use of this genome sequence data, in the future, we could be breeding a new variety in just about 3 years,” he adds. According to Professor Huanming Yang, Chairman of BGI-Shenzhen, the world’s largest genomics institute and a key partner of this project, "the pigeonpea collaboration with ICRISAT is a milestone in the partnership between India and China, showcasing the excellent working dynamics and understanding among Indian and Chinese genomics scientists. I hope more partnerships like this will be established in the future, and I believe this will surely bring a significant difference to the whole world." India is the largest producer of pigeonpea, but crop productivity in the country, as well as in sub-Saharan Africa, is only less than 1 ton per hectare. An improved understanding of the pigeonpea genome will have a major impact on improved crop productivity, tackling pests and disease constraints in production, and improved resistance to harsh environments and the future variable climate. Pigeonpea is the first “orphan crop”, the first “non-industrial crop” and the second food legume (after soybean) with a completed genome sequence. It is also the first time that a Consultative Group on International Agricultural Research (CGIAR)-supported Center like ICRISAT has led the genome sequencing of a food crop. The sequencing was accomplished by a global research partnership, the International Initiative for Pigeonpea Genomics (IIPG), led by ICRISAT with partners such as BGI –Shenzhen (China), US research laboratories like University of Georgia, University of California-Davis, Cold Spring Harbor Laboratory, and National Centre for Genome Resources, European research institutes like the National University of Ireland Galway and also support from the CGIAR Generation Challenge Programme, US National Science Foundation and in-kind contribution from the collaborating research institutes. For the full article at Nature Biotechnology, please check the link: http://www.nature.com/nbt/journal/vaop/ncurrent/abs/nbt.2022.html. NextGen Indian NARS leaders with Team ICRISAT. THE NATIONAL ACADEMY of Agricultural Research Management (NAARM), Hyderabad organized a training program for a group of 10 NARS senior executives on 4 November at ICRISAT-Patancheru. Participants were given an orientation on the innovative institutional systems of the Agribusiness Innovation Platform (AIP), with a briefing on the Agribusiness Incubation (ABI) program presented by Karuppanchetty and that of the Nutriplus Knowledge Program (NKP) by Saikat Datta Mazumdar. B Hanumanth Rao, IP Manager, conducted a session on management of intellectual property at CG Centers. The participants also visited the AIP offices, laboratories and the genebank. Staff and families of USAID and the US Embassy in Mali at ICRISAT Bamako. On 5 November, about 20 staff members of the USAID and US Embassy accompanied by their families visited ICRISAT’s Samanko office. The delegation, led by Eric Shutler, Deputy Team Leader of the USAID Accelerated Economic Growth (AEG), was welcomed by Farid Waliyar, ICRISAT Director for West and Central Africa (WCA). Eva Weltzien and Fred Rattunde showed the visitors the sorghum improvement programs and demonstration plots and briefed them on soil fertility management and Striga control options. They also visited the West African Seed Alliance – Seed Project (WASA-SP) sorghum and maize demonstration plots and were shown a presentation by Karamoko Traore, WASA-SP Scientist. WASA-SP is one of the major projects funded by USAID and being implemented by ICRISAT. Among the guests were team leaders of health and education programs who showed keen interest in ICRISAT’s activities in the region and its future priorities. The visit affirmed the strengthening of the relationship between USAID and ICRISAT, and USAID’s growing interest in ICRISAT’s activities in the region. CLL Gowda addressing the summit in New Delhi. Program Director for Grain Legumes CLL Gowda represented DG William Dar at the 9th Knowledge Millennium Summit – 2011 organized by ASSOCHAM, India at the ITC Mourya Hotel, New Delhi on 8 November. The theme of the summit was “AIM@8% Growth in Agriculture in India and Worldwide.” AIM refers to Agriculture-Innovation-Markets, closely mirroring ICRISAT’s IMOD strategy. The Chief Guest at the event was Karnataka Chief Minister DV Sadananda Gowda. John A Pickett from UK (winner of the Wolf Foundation Prize in Agriculture) delivered the Millennium Address on “Innovations for sustaining intensification of agriculture production” while Ramesh Srinivas from KPMG (the knowledge partner for the Summit) made a presentation on “Taming food inflation through innovation in agribusiness,” based on their study conducted this year. CLL Gowda’s presentation on “Overview and emerging issues and challenges in the agriculture sector” highlighted the contribution of international agricultural research-for-development (R4D) in attaining a 2nd Green Revolution and an inclusive, sustainable agricultural growth. 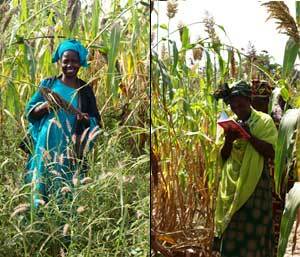 Women farmers during the pre-harvest evaluation of sorghum in Dioila. Women farmers from Mali (Mopti, Tominian, Koutiala, Kita, Kati and Siby) and the central plateau of Burkina Faso (Kaya) who are collaborating with the McKnight Foundation Seed Project, as well as with ICRISAT’s HOPE and PROMISO 2 projects on improving sorghum productivity sent 60 representatives on a field visit to Dioila, Mali on 27-28 October, where they have been active for several years identifying superior sorghum varieties and hybrids. These farmers have experience in conducting small varietal trials (with a few entries), but have not had the chance to choose from a larger set of more diverse materials. In fact, they mostly come from zones where agriculture is less intensified than in Dioila. ICRISAT’s key partner in Dioila is the Union of Local Cereal Producers (ULPC) which unites 47 village-level cereal producers’ cooperatives, among which figure exclusive women cooperatives that also focus on commercial cultivation of cereals and other crops. The women farmers visited a demonstration plot of the hybrid ’Pablo’ near Dioila, and had interactions on its cultivation with farmer Sambou Sidibe, a retired teacher and member of the Institutd’ Economie Rurale (IER) users’ advisory committee at its Sotuba research center in Bamako. Following a presentation on ULPC, they visited ULPC’s grain and seed storage facilities. In Wacoro village (Dioila), men’s and women’s cooperatives are jointly evaluating new varieties. While the men’s group has conducted a trial with 32 new varieties chosen by researchers and farmers, the women’s cooperative has chosen the four most interesting varieties and tested them in their own fields, using two crop management options. On 28 October, the women farmers assisted in the pre-harvest evaluation of 32 entry trials in Wacoro village along with women’s groups from the village, who together discussed crop intensification options. Maimouna Coulibaly, a member of the women’s group from Wacoro, showcased her experiment with five sorghum varieties, and a basal fertilizer dressing using ashes from cooking fires. The women proudly shared information on the benefits accrued from their cooperative’s grain storage facility and the new multifunctional grain processing platform (comprising a diesel engine, a decorticator, and a flour mill) which can also be used for Shea nut processing. A lively discussion ensued about the advantages of getting organized as a group, as well as methods and tools for effective variety evaluation and seed production. Rex Navarro with AMIC Secretary General Sundeep Muppidi in the ABU seminar in New Delhi. Recent global events like the ‘Arab Spring’ and the European economic crisis have revealed how critical a free and independent media is for good governance and a functioning democracy. Along these lines, the Asia-Pacific Broadcasting Union (ABU) in collaboration with Friedrich Ebert Stiftung (FES) conducted a seminar on media and governance on 5 November in conjunction with the 48th ABU General Assembly in New Delhi. Serving as forum of discussion and networking among 500 broadcasters, the event, hosted by India’s largest public broadcaster (Prasar Bharati), assembled 126 organizations from 46 countries. 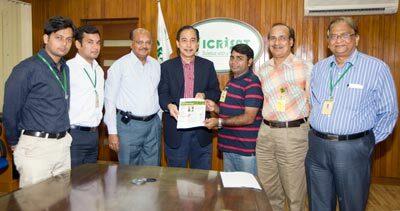 ICRISAT was represented by Communication Director Rex Navarro through the invitation of the Asian Media Information and Communication Center (AMIC). The Singapore-based AMIC is an active partner of ICRISAT in development communication. “The most important precondition for a democratic media system is the political and economic independence of the media and a legal framework to guarantee its independent status,” said Erik Bettermann, Director General of Germany’s Deutsche Welle in his keynote address. “Media professionals face great challenges brought about not only by political and social transformations but by rapidly developing media technologies as never before,” he added. Likewise, the forum emphasized that democracy cannot exist in the absence of a free press since democracy is based on popular will and opinion, which is in turn shaped by public awareness and knowledge. The pigeonpea team in pursuit of a promising herbicide. An effective herbicide that can control weeds in pigeonpea is every farmer’s dream-come-true. At the same time, it would greatly benefit ICRISAT’s pigeonpea researchers in maintaining weed-free experiments and in reducing crop-weed competition for water and nutrients. Also, being able to use seasonal labor for planting, crossing and more relevant activities instead of re-directing it towards tedious and unrewarding weeding is always a bonus. Weed control experiments using new herbicide options conducted at ICRISAT-Patancheru during the current 2011 season have shown this is possible. In the first pigeonpea field (black soil), two herbicides were used: Pursuit® (a.i. Ammonium salt of imazethapyr) and Targa Super (a.i. Quizalophop-ethyl). The herbicides were applied post-emergence in different concentrations to three rows of pigeonpea of 100-m length each. Pursuit® was more effective in controlling weeds than Targa Super. Encouraged by this result, the Pigeonpea Breeding group of Isabel Vales, Vijay Kumar and Patil, supported by the FETS team of M Prabhakar Reddy, Hanumanth Rao and S Pillay, decided to do a follow-up experiment to confirm the observations. In the second experiment, the herbicides were applied post-emergence to extra-short duration pigeonpea grown for seed multiplication in red soil. Pursuit® was tested together with another herbicide, Oxyfluorfen (a.i.diphynyl ether) and both were applied 27 days after planting. Data was collected at different times for percentage of weeds per plot, vigor, height, flowering date and chlorosis. The experiment proved the effectiveness of Pursuit® in controlling problematic weeds like broad leaf weeds and nutsedge. A dosage that is safe for the pigeonpea crop and that also controls most of the weeds has been identified. Follow-up experiments will be conducted to further confirm the effectiveness of Pursuit® in order to evaluate residual effects and to identify the minimum dosage that would minimize its cost while at the same time effectively control weeds. Pursuit® can halve the cost of weed control in pigeonpea and will also reduce the drudgery of manual labor since at least three weedings are needed during the growing season. Though pigeonpea is not included in the list of registered crops for which Pursuit® is approved, there is definitively scope for effective control of weeds in pigeonpea fields using this herbicide. Participants of the special session on Climate Change in Dharwad. ICRISAT organized a special session on “Climate change and rainfed agriculture” during the 71st Annual Conference of The Indian Society of Agricultural Economics held at the University of Agricultural Sciences, Dharwad, and Karnataka on 3 November. ICRISAT’s team led by Cynthia Bantilan, Research Program Director on Markets, Institutions & Policy (MIP) and other scientists of the program showcased findings from ongoing projects related to Climate change and rainfed agriculture. The session commenced with a presentation by NP Singh on “Tracking adaptation pathways and prioritizing strategies for enhancing grass-root level resilience to climate change in SAT India” highlighting findings from the ADB-funded project “Vulnerability to climate change: Adaptation strategies and various layers of resilience.” In his presentation, he asserted the need for an action plan tailored to suit government programs and policies oriented towards enhancing resilience among poor households. Piara Singh, ICRISAT consultant, projected future yields and performance of sorghum and groundnut under climate change scenarios and emphasized the need of varieties with heat tolerance, drought, and water logging resistance along with efficient management options. Uttam Kumar Deb (Principal Scientist) demonstrated how climatic variables are changing the socio-economic status and welfare at the household level by highlighting insights from ICRISAT’s village level studies. Complementing this, Parthasarathy Rao (Principal Scientist) presented a paper on supply response and investments in agriculture in Andhra Pradesh, explaining the potential to increase aggregate crop output through realization and improvement of investment priorities, supported by proper government policy. The presentations were followed by lively interactions/discussions. The session concluded with the reiteration of the importance of grassroot level information as a feedback mechanism for policy advocacy in addressing the climate change development agenda. A parallel poster session on findings from the ADB project on climate change was also held. Global Diabetes Walk at Patancheru to spread the message on how to prevent, treat, control and diagnose complications arising from the disease. Today, 285 million people in the world live with diabetes, and 80% of those are in low- and middle-income countries. By 2030, about 4.5% (more than 370 million) of the world’s population will suffer from Type 2 diabetes. India has the highest number of diabetics, with 31.7 million in 2000 and a projected 79.4 million by 2030. The diabetes epidemic in sub-Saharan Africa is one of the fastest growing in the world, increasing 2.6 fold in 30 years. World Diabetes Day is observed every November 14 since 1991. 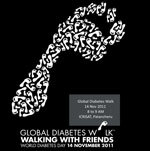 To mark this day and increase awareness of a chronic, debilitating and costly disease that poses severe risks for families, countries and the entire world, ICRISAT will hold a Global Diabetes Walk on 14 November on the ICRISAT campus. The walk will be led by ICRISAT Director General William Dar and The World Vegetable Center (AVRDC) Director General Dyno Keatinge. Among the other events planned by ICRISAT on this occasion are blood sugar and diabetic retinopathy screening camps and a health awareness talk on the Role of diet in diabetes by Dyno Keatinge. His talk is in line with AVRDC’s Bitter Gourd Project and its plan to distribute multilingual recipe brochures to promote the consumption of bitter gourd (Momordica charantia) in communities in India, Tanzania, Thailand, and Taiwan. Bitter gourd can be eaten raw in salads or as juice, or cooked in stews, soups, or stir-fried dishes.Previous studies with animals and humans suggest that vegetables help diabetics control blood sugar. Plant breeders from AVRDC and partners working on the Project seek to optimize the level of anti-diabetic compounds in vegetables. There is no cure for diabetes, but the quality of life of people with diabetes depends on effective blood glucose control. Effective treatment includes proper diet, weight control, exercise, and medicine.